HomeBlogThe world is watching – Olympics without dropouts! Four cabinets of switching gear and satellite modulators are backed up by 4 Multiplus inverters, each having 24V/200Ah battery storage, to provide uninterrupted power. 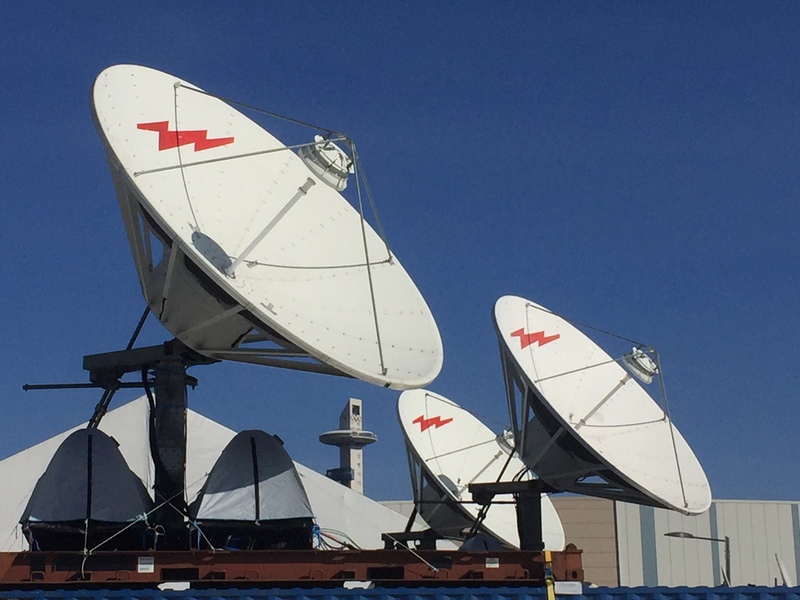 Multi-Link Holland – is a Dutch company which has been providing satellite up-link communications for reportage and sporting events to Broadcast Networks for almost 20 years. Marco van Uffelen, one of Multi-Links engineers, says that the key to success is portability and an ethos that no problem is insurmountable. 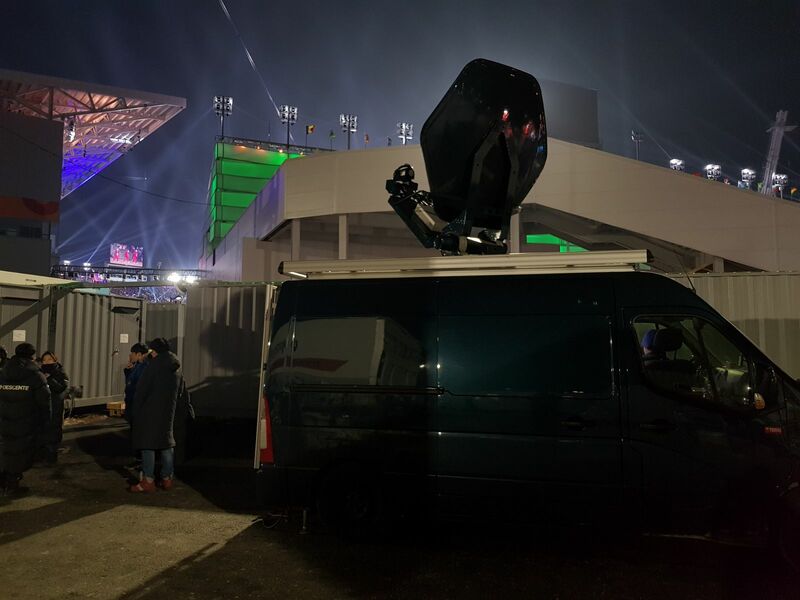 Their equipment is ready to go at a moment’s notice by road, air or sea – and when you think about the hurdles to providing remote outdoor broadcast, from anywhere – you can see why experience counts. Interestingly, one of the first things they do – having arrived in the country of deployment with a cargo of technical wizardry – is to buy some truck-batteries! Too heavy to lug half-way around the world, lead/acid batteries are available anywhere and work reliably and predictably. Even when grid electricity is available, you must be prepared for the possibility of it failing – hence the provision of an ultra-reliable uninterrupted power supply for the dazzling array of satellite amplifiers, audio/visual monitors, satellite modulators and switching gear – as seen above …secured by 8 x Victron Multiplus 24V units which will guarantee an Uninterruptible Power Supply. This huge 3.7m ‘Flyaway’ Antenna can be loaded as air freight. 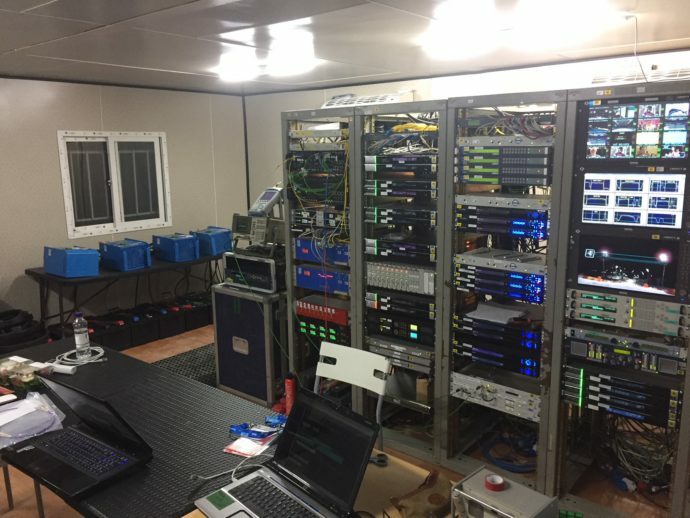 Installed near the Gangneung Oval – where the Speedskating has been taking place – the antenna has high-power satellite amplifiers backed up by a 5kVA Multiplus Quattro with two 250Ah Truck Batteries. You can probably catch a glimpse of the ‘tents’ which have been installed over the amplifiers to protect them from the snow. 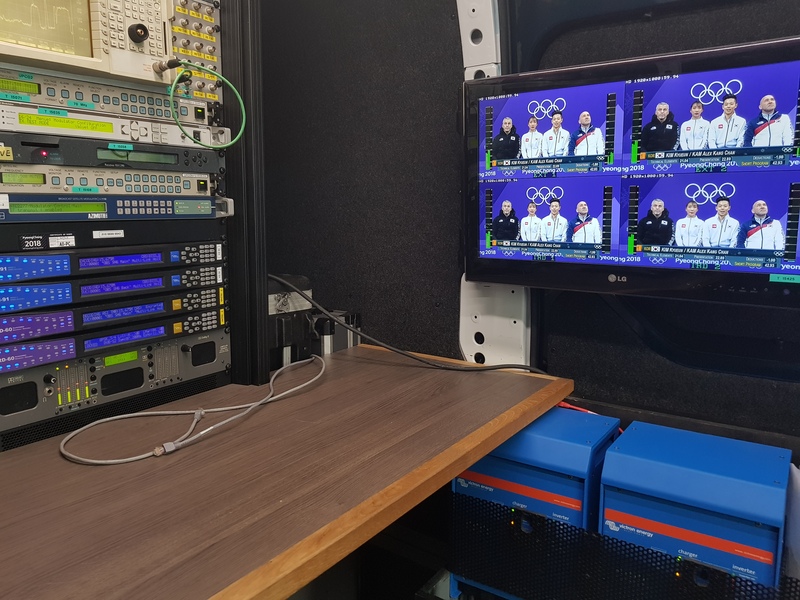 Acting as back-up this van follows wherever the action is taking place to beam broadcast data back to the International Broadcast Centre in Pyeongchang. 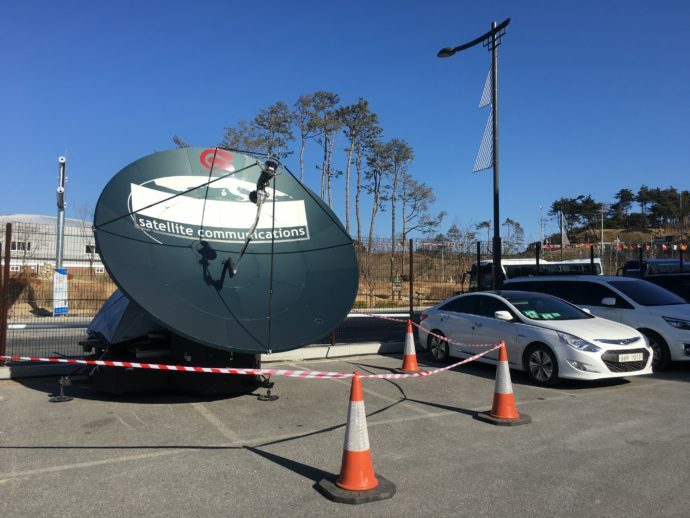 Multi-Link’s mobile Digital Satellite News Gathering van – in the image above – sends ‘footage’ back to the International Broadcast Centre, where it can be re-transmitted using the main amplifiers and dishes at the Satfarm. At the Winter Games the van is always in attendance as backup… regardless of whether a fibre optic connection to the IBC is available or not. The mobile ‘Digital Satellite News Gathering’ van is capable of generating 6kW/230V from its own engine – Two Multiplus 12/3000/70 units are on standby to provide uninterrupted power.